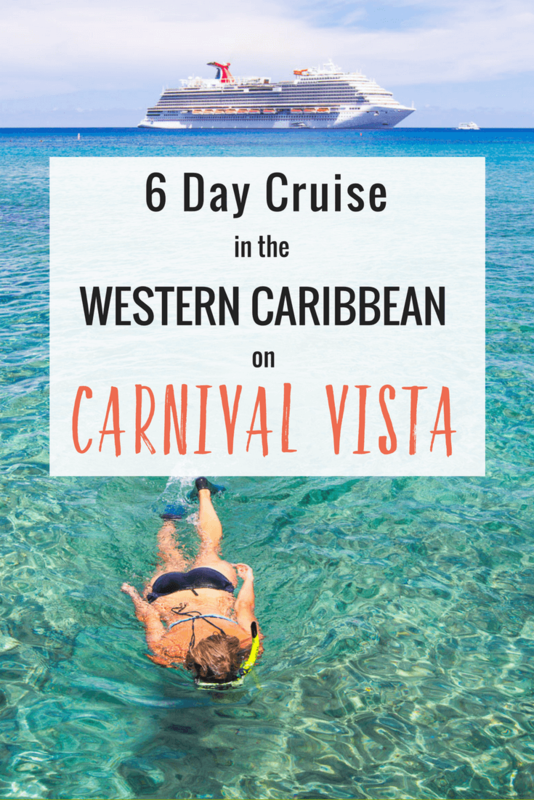 Want to see what it’s like to take a 6 day Western Caribbean Cruise on Carnival Vista? 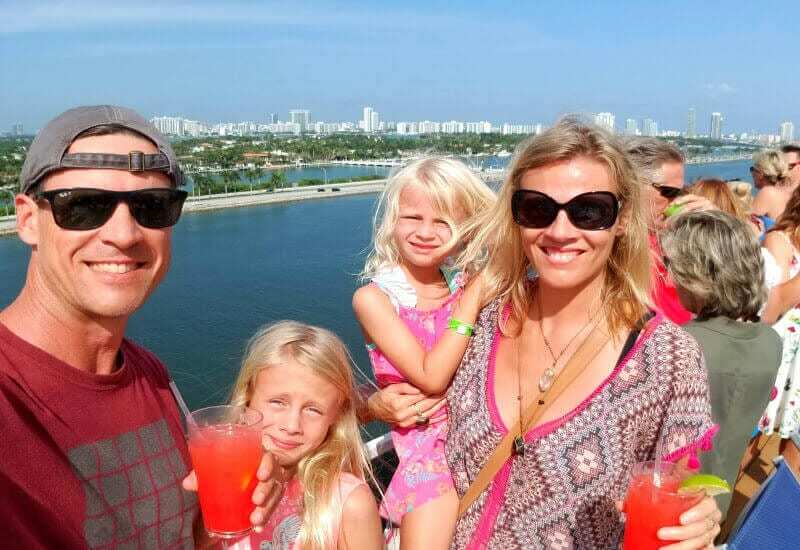 In early September we sailed on this ship as guests of Carnival Cruise Line and created some priceless family memories that we are sharing in this post, plus some helpful tips for cruising! 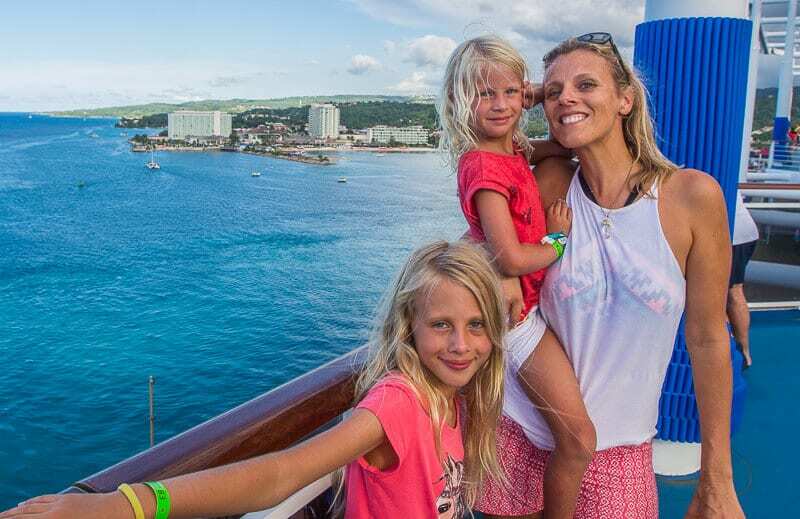 We are late adaptors to cruise life, it wasn’t until our late thirties that we took our first cruise, preferring independent land based travel, but we now see the many benefits of taking cruises for families. As a busy family, we enjoy the simplicity of cruises – planning a two week long road trip or an overseas vacation can be time consuming and stressful. On a cruise, you basically put your bags in your room and you’re done. No need to constantly unpack and pack again whilst changing hotels, jumping on flights, or driving from place to place. 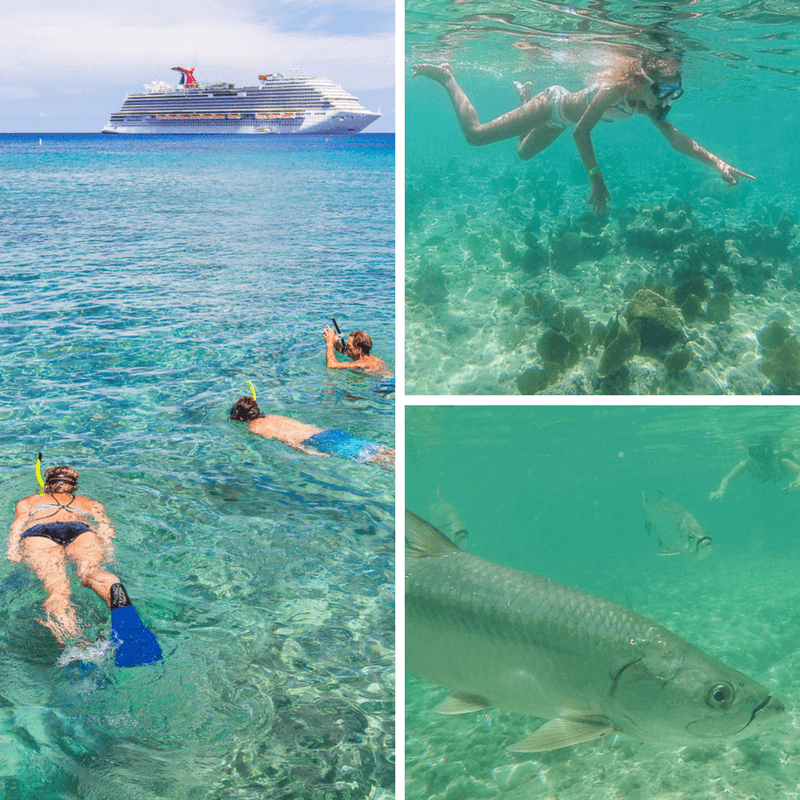 And all the activities and entertainment is at your fingertips – and mostly included in the cost of your cruise! 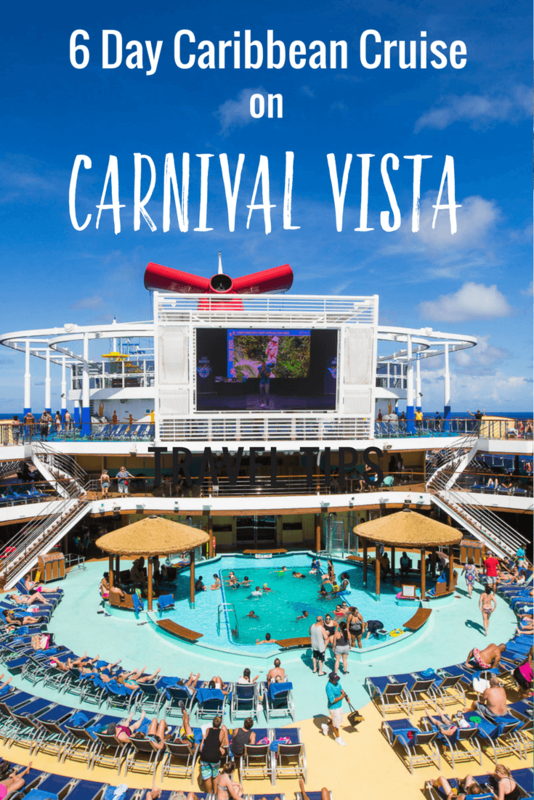 So if you’re planning your first family cruise, and are interested in what Carnival Vista has to offer, this post is for you! 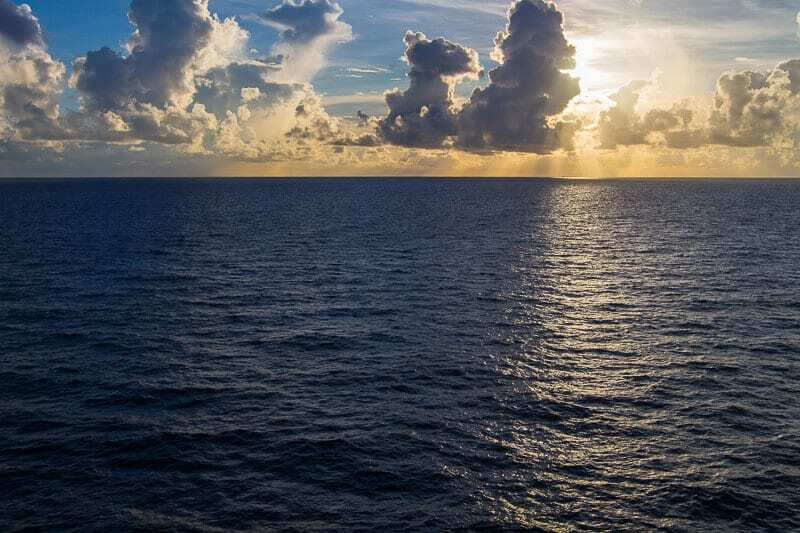 Before this Carnival Western Caribbean cruise, I thought that 6 day cruises would be my maximum time I would like to be on any ship, but now after cruising on the Vista I’m increasing that to 10 days. 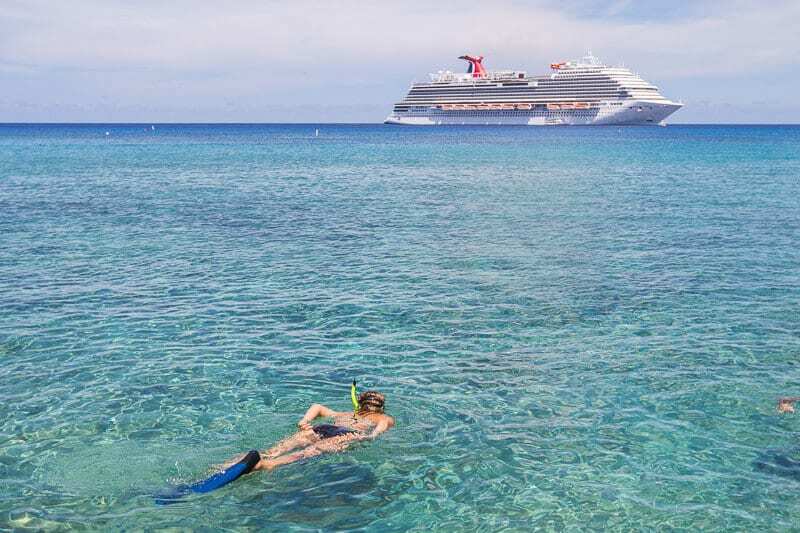 When you consider you have three shore days that only leaves you with three days at sea and there is so much to do on Carnival Vista! We did a lot on board the ship but there are still many things we missed, plus I would have loved more time to just chill and sit and read a book, knowing our kids needs were taken care of! I think a 10 day western Caribbean cruise would be perfect! This is the newest Carnival cruise ship, and the largest Carnival Cruise ship with a guest capacity of 3,934 and a length of 1,055 feet. 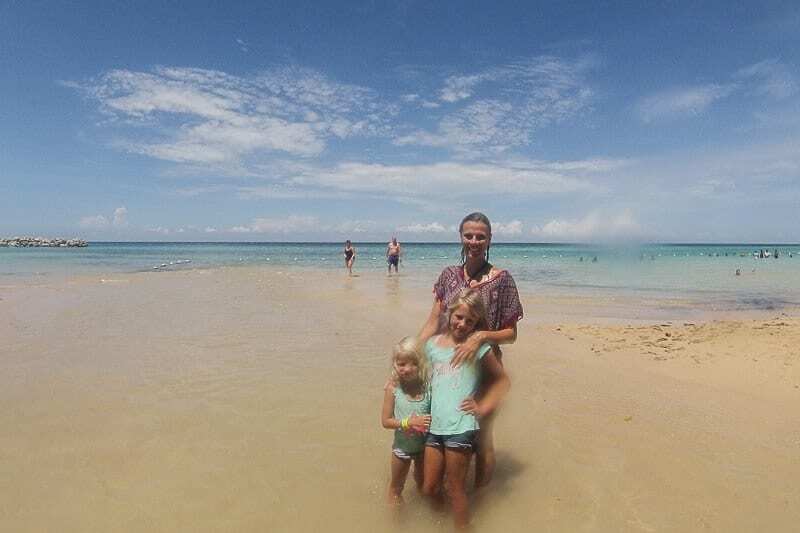 And as you’ll read below and see from our Carnival Vista pictures, and by watching our video, we walked almost every square inch of the Carnival Vista ship. Don’t miss the Sailaway party. It’s the place to be at the start of any cruise, and this one on Carnival Vista was cool. It’s always a fun way to kick off any cruise and get excited about the days ahead. 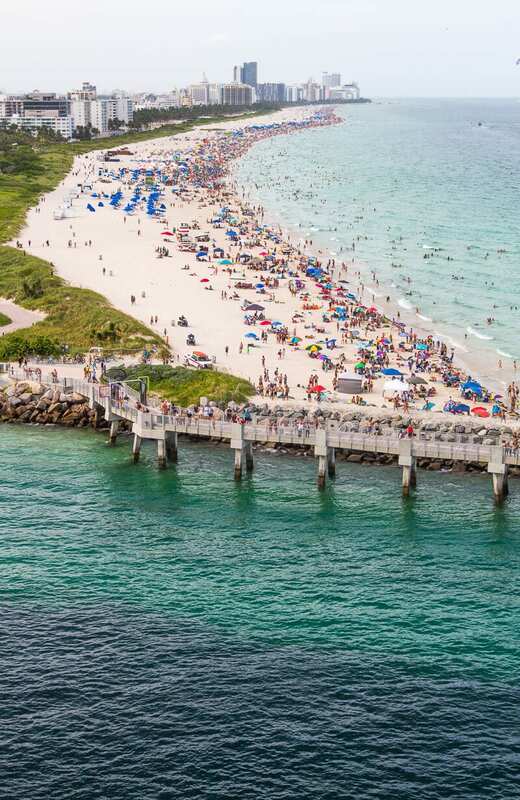 You might think the Vista is crowded by looking at the above photo, but that’s because almost everyone is in the same location at the same time for the party. Trust me, this ship is HUGE and there is plenty of room to spread out. Once we checked into our stateroom (7264), grabbed some lunch at the buffet, did a quick lap of the ship to get our bearings, and attended to mandatory safety briefing, we headed to the top deck for the sail away party. This party was also our first introduction to cruise director, Matt, and instantly you could tell he was born for this role. 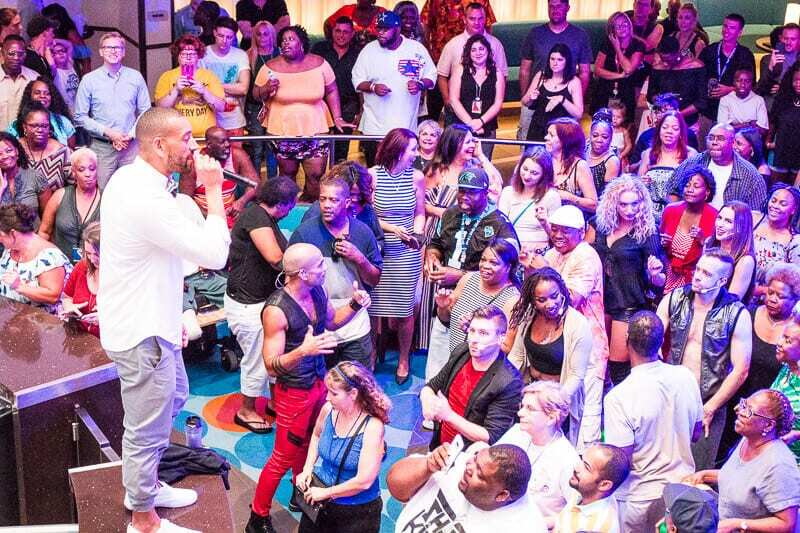 Matt had the ship rocking with most of us up dancing, singing, and sipping on a cocktail as we sailed away from Miami. The deck area around the pool was packed as they followed Matt’s lead with dance moves and tango lines. so I guess you could say Matt is the director of FUN! We’ve been fortunate to sail out of Sydney Harbor on Carnival Spirit, and I don’t think you can beat that setting, but with views over South Beach as we sailed towards Jamaica, departing on this Caribbean cruises from Miami was a spectacular start! For 90% of our meals we chose to eat in the main dining room (Horizons Restaurant) where we were served a three course meal (included in your cruise fare). We preferred this more formal dining option of sitting down to a set menu that rotates to that of the “buffet” style option at the Lido Marketplace. And the kids menu was nice with an activity book for them each evening. At the buffet you have to deal with lines and crowds, and there’s always the temptation of eating too much too fast and mixing foods that really shouldn’t go together – so you just end up feeling full and yucky! Lido Marketplace can get very crowded for breakfast, and most lunch hours on sea days can get especially crowded also. At Horizons, we found the quality of the food great and you eat at a much more sensible pace. The meal is filling without leaving you feeling bloated – more room for cocktails right! Plus, sitting down to a set table and being waited on is what we enjoy about cruising. At home we are always running around crazy and dinner time is a chaotic mess, so it’s nice to have a more organized and pleasant dining experience. And the wait staff in Horizons are incredibly friendly, they are from all over the world, and we loved chatting with them. Not too mention, it’s a ton of fun in the dining room as the staff often break out into an entertaining dance routine. 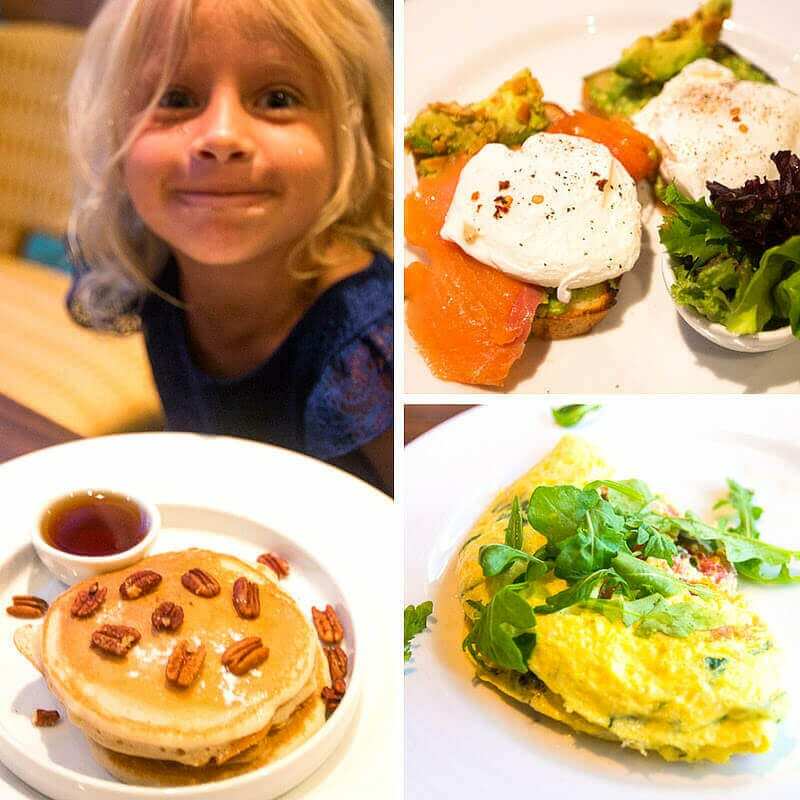 In the restaurant you have the option of Early Dining or Late Dining, we went with Early considering we have young kids, and often we scored a table with ocean views. Over the duration of our Western Caribbean Cruise we enjoyed a nice selection of salmon, steak, duck, scallops and shrimp – and for those who are a little daring (like Caz) they have “Rare Finds” such as frogs legs! (see in our video). BUT, our absolute fave meal at Horizons was the chocolate melting cake for dessert. We ordered this dish every night for a treat, can we have the recipe please?!! Another cool thing about eating in the dining room is that the basic theme of each dinner ties in with each port you have just visited, making it more interesting. If you have dietary restrictions like us (gluten free) they are more than willing to accommodate you. 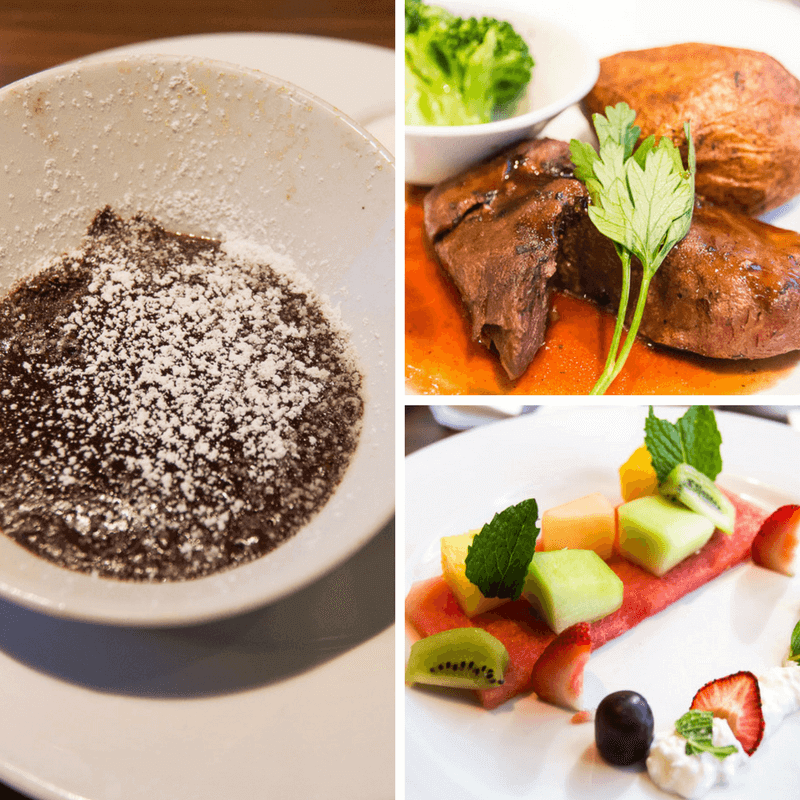 We simply ordered our next evening’s meal during the previous night’s dinner and they would create whatever dish we wanted gluten free – even our fave chocolate melting cake – winning!! When you order a bottle of wine for dinner, and you don’t finish it, no problem, the staff will keep it for you for tomorrow night – just give then your stateroom number. But if you want the all-you-can-eat style buffet go for it. We ate there on two occasions, when we first boarded in Miami for lunch, and on another lunch day when we were in a hurry to get to an activity. 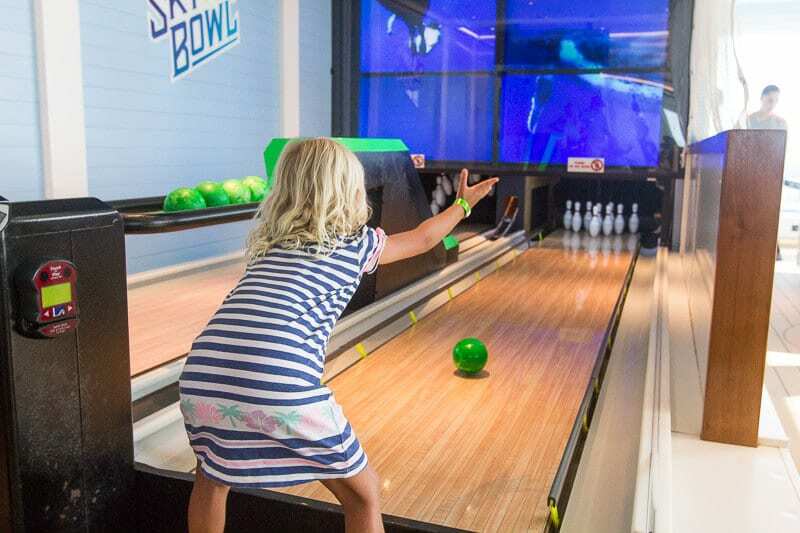 Plus, open 24/7 on Lido deck is unlimited frozen yogurt and soft-serve ice cream – if we couldn’t find our kids we knew where to look first! AND, if you love your pizza, get excited because Pizzeria del Capitano is open to everyone, 24 hours a day, and is also included in the cost of your cruise – dangerous! If there’s one thing about cruises, it’s that you have CHOICES and you’ll never go hungry! You can eat at all these places on Carnival Vista. After our first nights dinner, we headed to the Liquid Lounge for the welcome aboard party. Cruise director Matt was in fine form cracking jokes and entertaining us with crowd participation antics that had us in tears of laughter. We were also entertained by dancing and singing before Matt moved the party to the Atrium Bar for more singalongs, dancing and laughter. 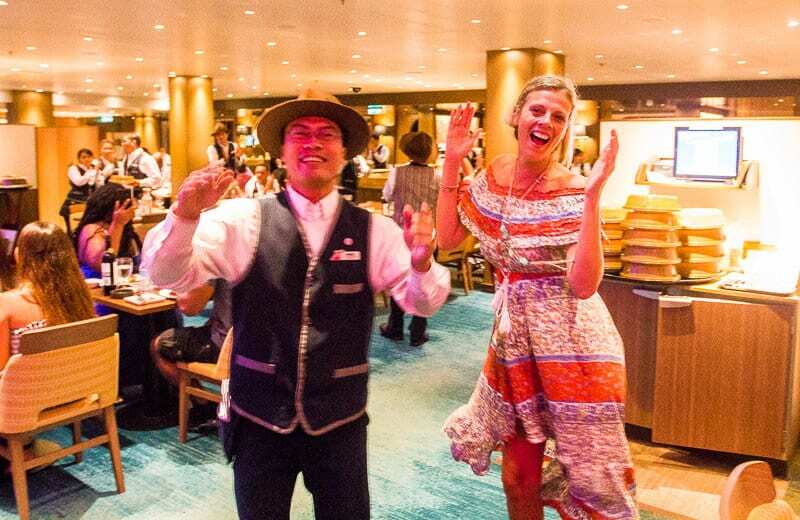 Cruise director Matt – life of the party! From there the party continued to Ocean Plaza but it was getting late and we’d had more than enough fun for day one. Back to our room we went and got settled into our stateroom to rest up for what was going to be a fun filled rest of the cruise. We are early risers at home and like to get active with some form of exercise at first light. Each morning I headed up to the top deck for a brisk walk around the designated walking/running track whilst the sun popped it’s head up over the Horizon. Whilst lots of people chose to hit the treadmills in the gym, I love walking outside in fresh air and seeing the sunrise. Caz and I tag teamed in the mornings with one of us staying in our room until our kids awoke. One morning Caz attended the yoga class in Ocean Plaza, she loves her yoga and at home we have an online membership to Grokker. There’s plenty of other options for starting off your day, some choose to sit on their room balcony or on the top deck with a coffee, others choose to sit on a sun lounge and read a book. Either way do what works for you. Each morning we headed back to the dining room (Horizons Restaurant) for breakfast. It was during brekky that we planned out our day. On your room door each evening you are given an activities guide that lists all the shows, activities and events for each day. Bring a few highlighters of different colors so each of you can go through the list and highlight what activities and shows interest you. There’s a TON of options each day and we found highlighting our faves worked well for us so we could clearly see each choice. Our kids had been excited for months waiting to hit the water slides on Carnival Vista so we headed straight there after breakfast on day one! Water Works is Carnival’s on board waterpark. 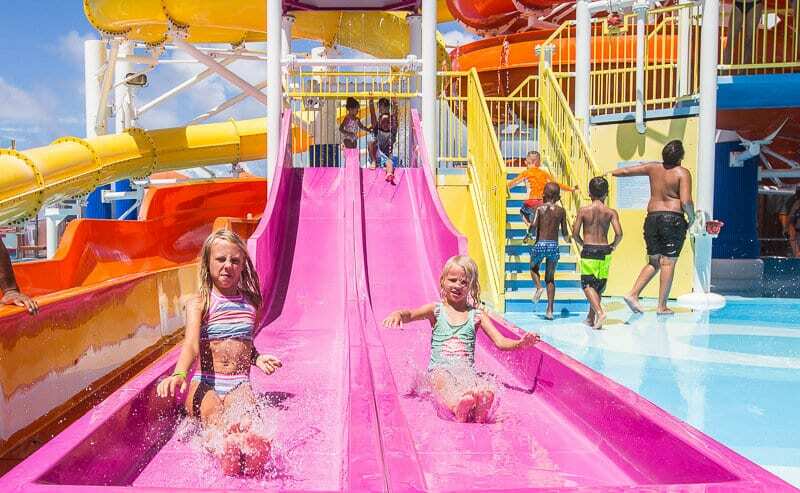 There’s two water slides for the big kids, dual side-by-side racer slides for the toddlers, a tipping bucket and splash area (as seen in our Carnival Vista video). This was obviously a popular spot on the ship for the duration of the cruise so be prepared for a little congestion but we found the wait times for the slides not too bad! S0 don’t forget to pack all your swimwear and sun protection! 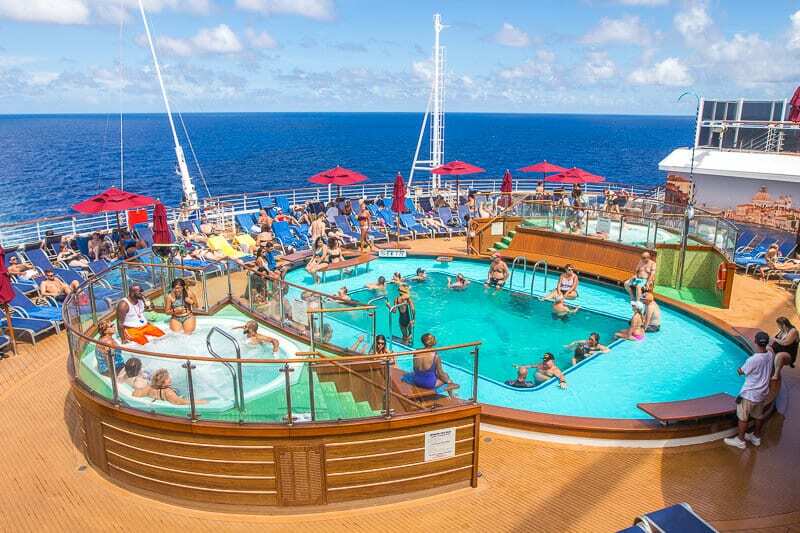 The main pool on mid-ship was also a popular spot for cooling off, we only swam here once actually, and if this is your first time cruising you might be surprised at how small the pools actually are in relation to the size of the ship. But this whole mid-ship section was a hive of activity day and night. It was a popular place for sun bathing whilst the DJ played tunes from the balcony, the Red Frog Rum bar was here, a dance off was held here, and movies on the big screen played at night. Another part of the ship we spent a lot of our leisure time was at Sports Square, and Kalyra and Savannah had a particular liking for the mini golf. In fact, this was their go-to place whilst we took 60 minutes time out and headed to the adults Serenity Deck (more on that down below). At Sports Square we also played pool, twister, and mini bowling. 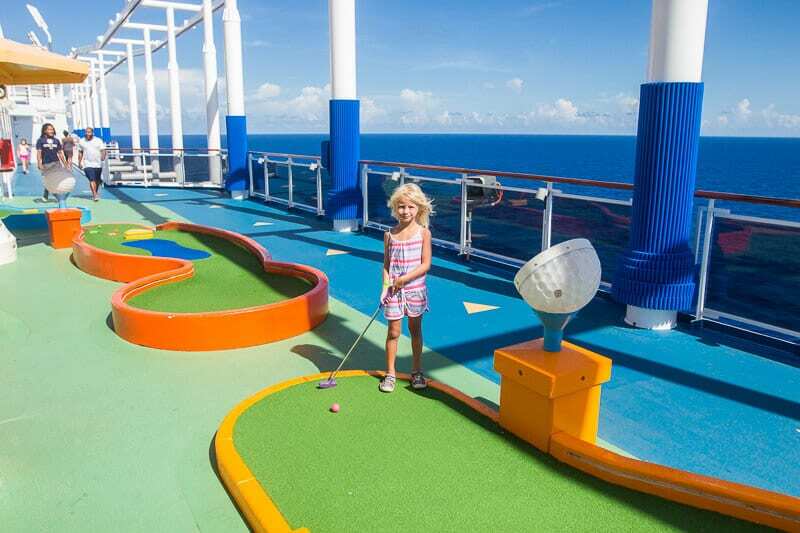 Watch it all in our Carnival Vista video, including Kalyra and Savannah’s hole-in-one at the same time! 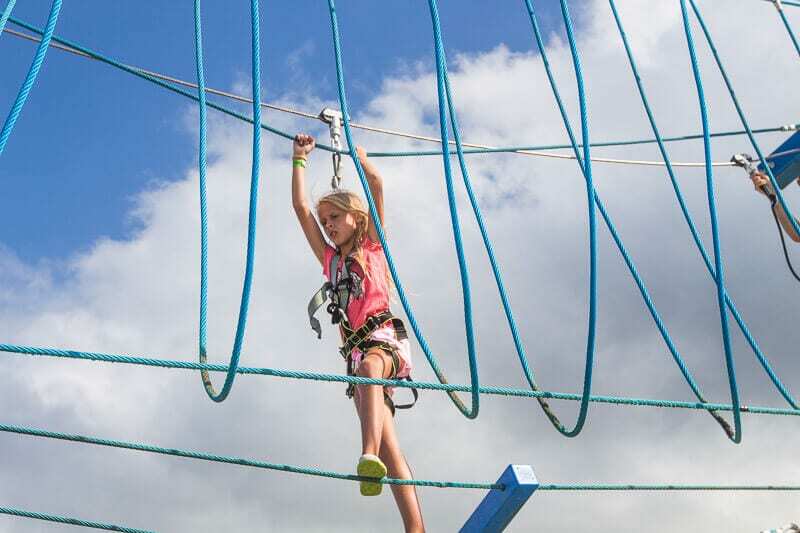 We love our high ropes courses, we’ve all done several of them around the world in a forest, but never on a cruise ship before which comes with ocean views and a cool breeze! Kalyra loved this course on the Carnival Vista cruise, I lost count of how many times she took on the challenge, and we love that it’s included in your cruise price. There are two courses to choose from, a beginner type course and a more challenging one, and it’s a great way to keep your kids active and off their devices!! And don’t worry, your kiddies are safely harnessed in. Again, check out our video higher up in the blog post to see us taking on the ropes course! This was super cool, and an industry first. Being the newest Carnival ship, the Vista is the only ship that has the Skyride (you can call them flying bicycles) and this was another activity Kalyra couldn’t wait to do leading up to our family cruise. On our first day at sea it was closed as it was too windy, but later on in the cruise we had several opportunities to do this. One time was just after hoping back on the ship from our shore excursion on Ocho Rios in Jamaica, which offered awesome views of the island as we cycled arund in mid air. 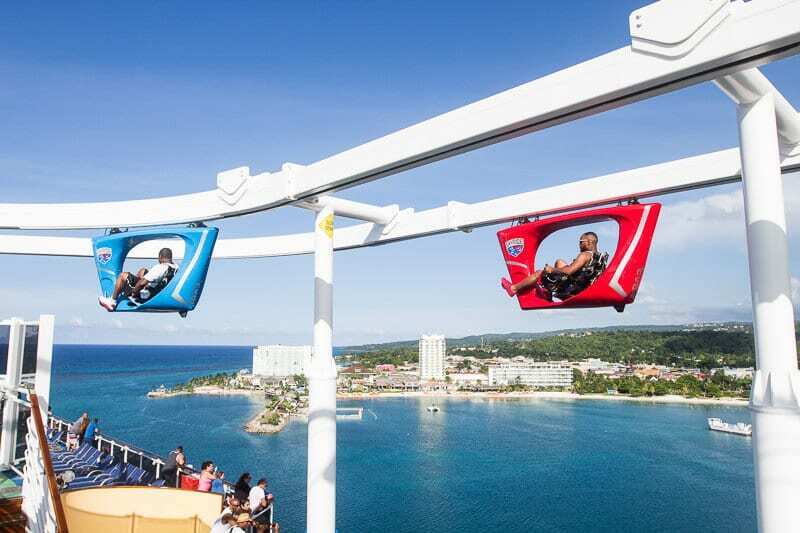 It’s a fun and relaxing way to get incredible views over the ocean and the ship below as you peddle around the track in mid air. Or really get into it and race each other! Again, you are harnessed in safely and the crew do a great job of running this activity! 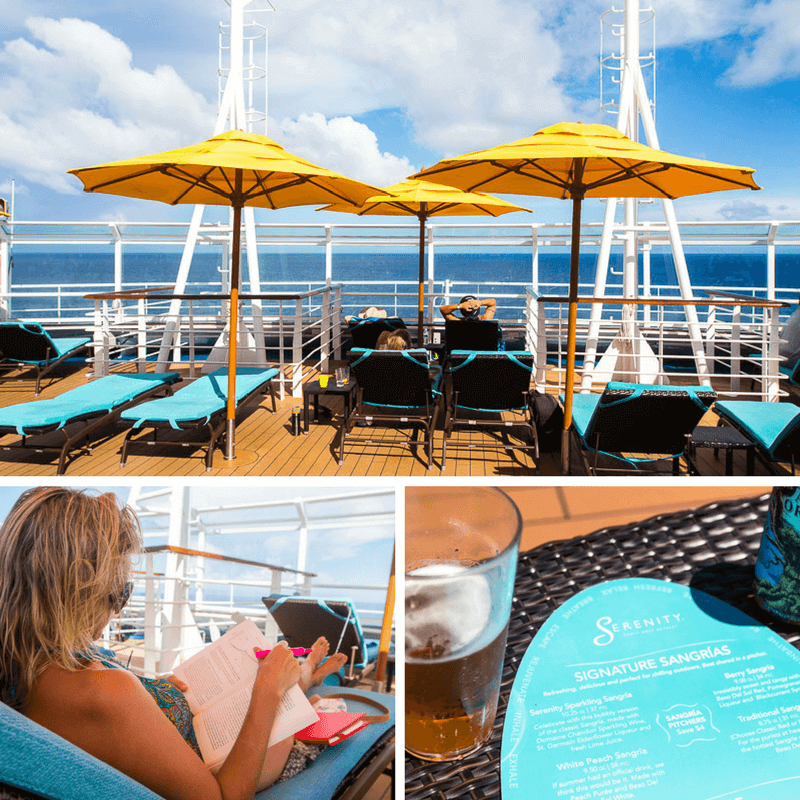 The Serenity Deck is your friend and savior! Serenity is an adults only retreat (21 years+) and the place we enjoyed going for some much needed time out whilst our kids were entertained in one of their numerous activities. And if you don’t have kids and want some “quiet time”, you can find it here too! In Serenity, there’s comfy cabana chairs and sun lounges with ocean views, a bar, two hot tubs, and a great salad bar. Oh, and I’d like to give Carnival Cruise Line a hat tip at this point and THANK them for having gluten free beer on the Carnival Vista cruise. We like to follow a gluten free diet as close as possible and we typically drank that, or cider, or wine. 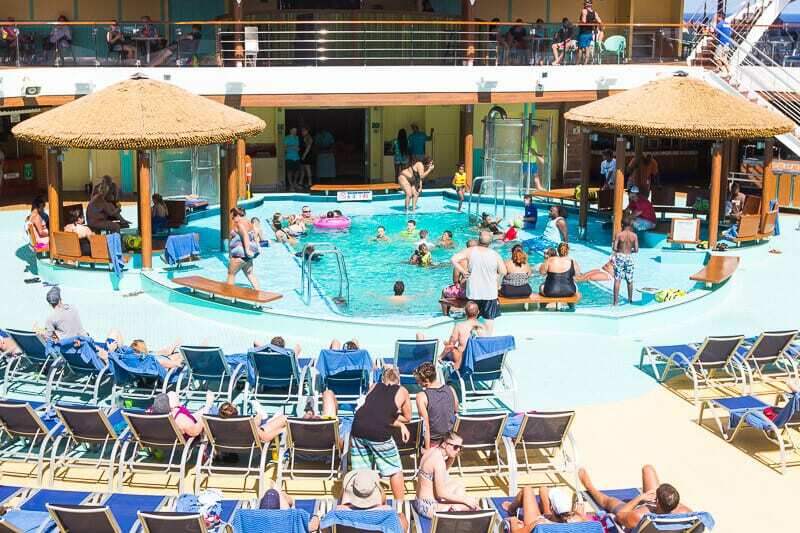 However, we did find it interesting that there isn’t a pool in the Serenity Deck area and only hot tubs, considering this is the Caribbean Islands and the weather is typically warm and humid – we personally didn’t feel like sitting in a hot tub. But we did cruise in early September, so maybe this region does cool down in the winter months?? 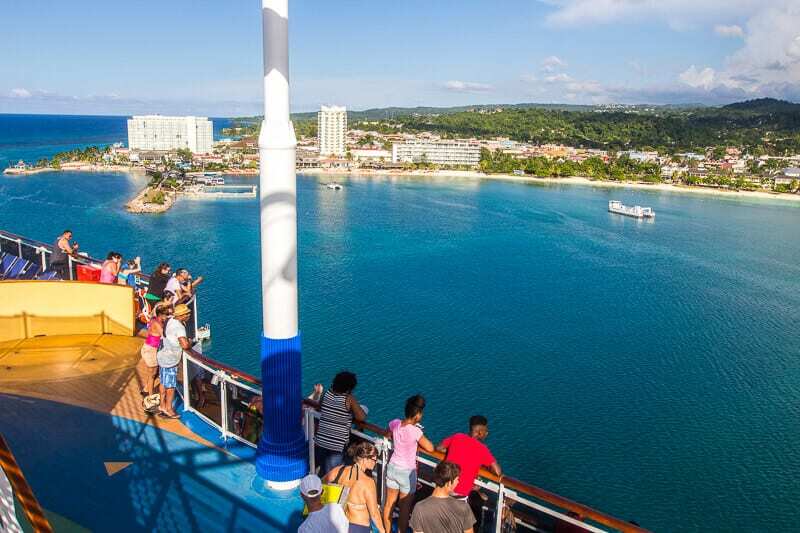 Our first port of call was Ocho Rios in Jamaica, which was our first time ever visiting Jamaica which was exciting. We’ve met plenty of Jamaicans on our travels around the world and know how fun and friendly they are, and just think how cool and calm Usain Bolt is on the running track! So we expected a fun time and that’s exactly what we got. 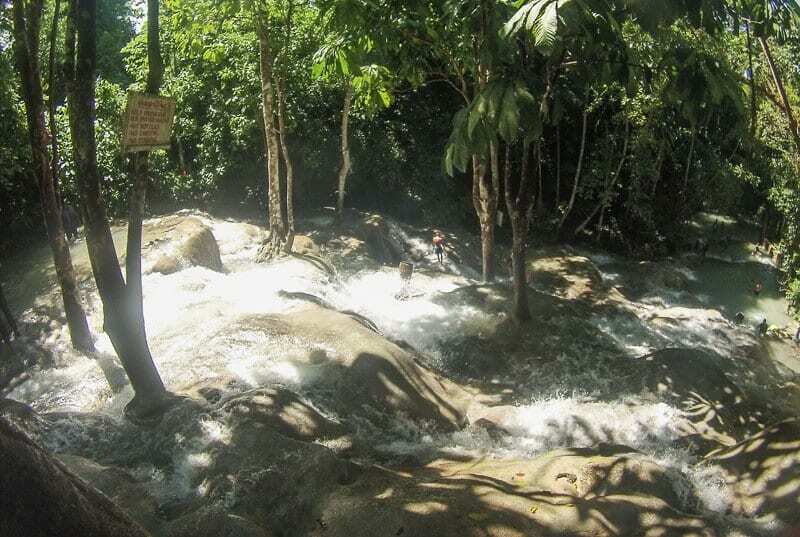 For our activities we chose the Canopy Adventure and Dunn’s River Falls activities. 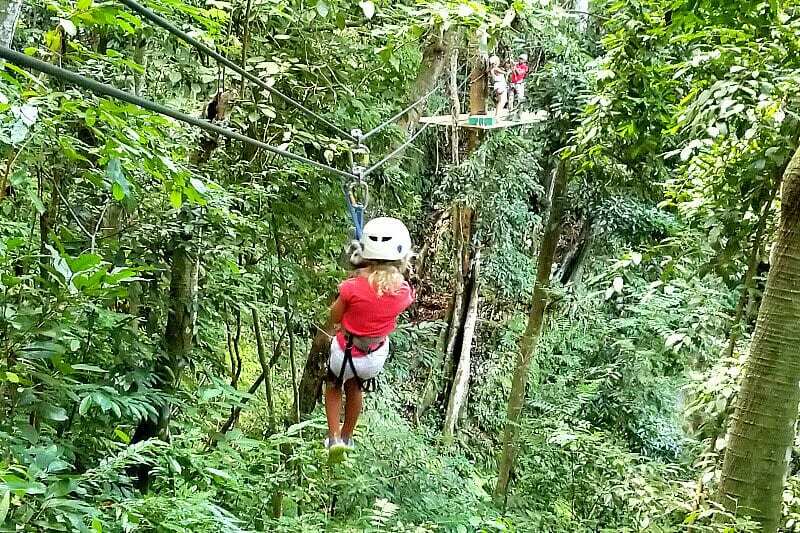 We love getting out in nature and zip lining through the forest, and we had a blast with the local Jamaicans running this activity. The minute we jumped in the minivan in port for the short drive into the forest, we were entertained with jokes and were all quickly saying “yeah mon”. 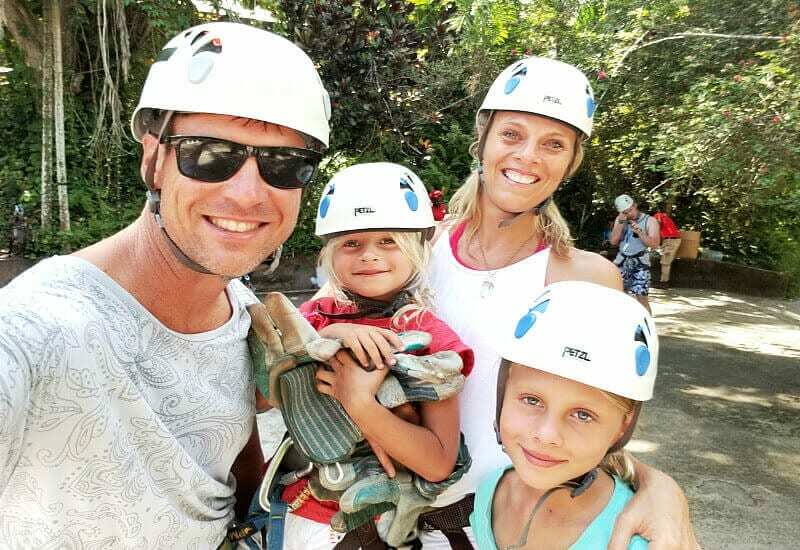 If you haven’t done zip lining before consider this activity for your kids, our little 5 year old Savannah has been zipping through the trees since she was three. By memory we did 8 zip lines and then sat down to a traditional Jamaican meal of jerk chicken with beans and rice. When we first arrived at Dunn’s River Falls and saw the size of this waterfall and the amount of water gushing down, we thought there’s no way we are literally climbing up this waterfall. But we did. And it is one of the craziest things we have done as a family and was totally awesome. It’s a beautiful waterfall that falls right onto a stunning beach, and we worked as a team to climb to the top. The guides do a great job of keeping everyone safe, and the rocks are actually quite grippy. Bring your booties or you can obtain the proper shoes on site – we wore our Keen sandals which did the job nicely! Another spot on our Carnival Vista cruise more catered towards adults is Tides Bar and Pool towards the back of the ship. 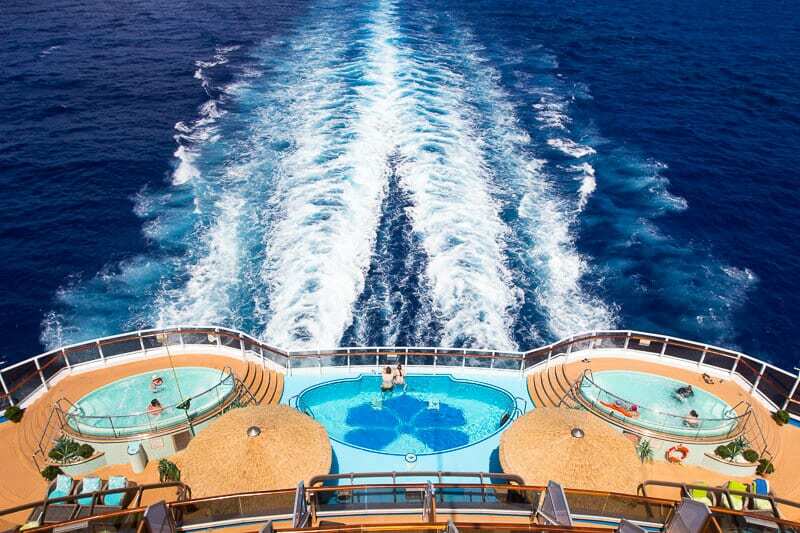 There’s a pool and two hot tubs, sun lounges and awesome views off the back of the ship. We did bring our kids in here whilst we chilled on the sun lounges with a cider, and they enjoyed a Shirley Temple (pink lemonade) so it’s not like and adults only section. Ok, so staying in one of the Havana Cabanas is now on our cruise bucket list. Just check out the views from their private pools!! 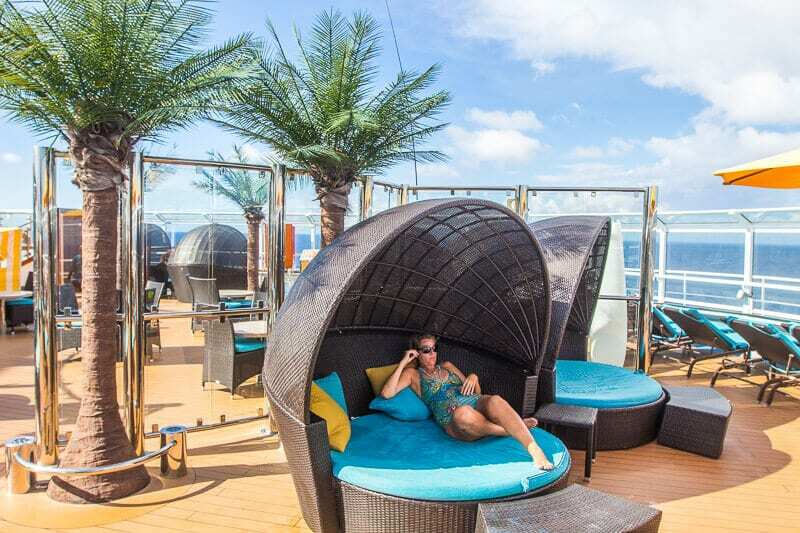 The Havana section of the ship is like an island retreat, Cuban style, and if you stay in one of these Havana Cabana staterooms they come with an outdoor patio and exclusive daytime access to Havana Pool. These pools are open to the general public from 7.30pm each evening so you can still get a taste of what it’s like to cruise in style, which we did. And we stepped into the Havana Bar one evening which was rocking with island music and style and everyone was having a ton of fun. 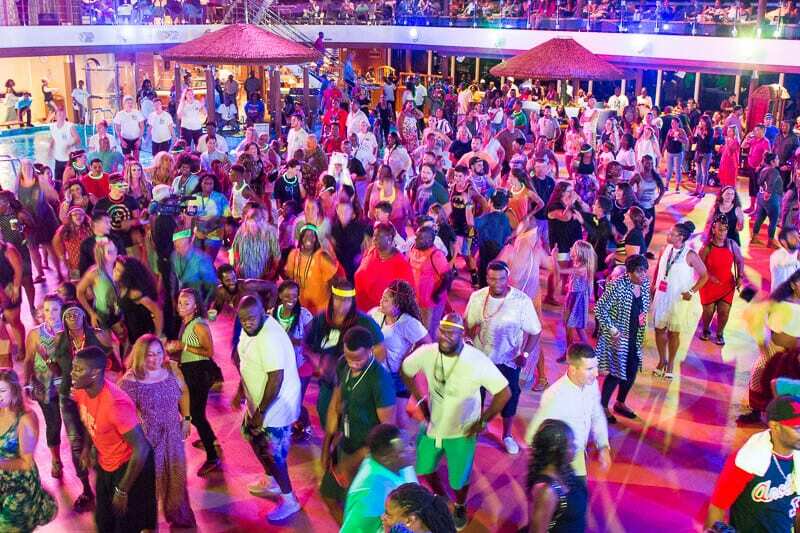 On one evening of our cruise was the Mega Deck Party, and again cruise director Matt was in his element putting us through our dance moves. I tell ya, dancing gets you moving and shaking and puffing, especially in the Caribbean humidity, and if you’re looking to stay active and keep the extra pounds off, joining in on all the dancing any chance you get! This was a fun family night on the ship decked out in our glow necklaces, and our kids really got into following along with Matt as he put us through the dance moves! Scroll back up and see all the fun in our Carnival Vista video at the 12:34 minute mark. We went to several of the nightly stage shows in the Liquid Lounge and really enjoyed them. 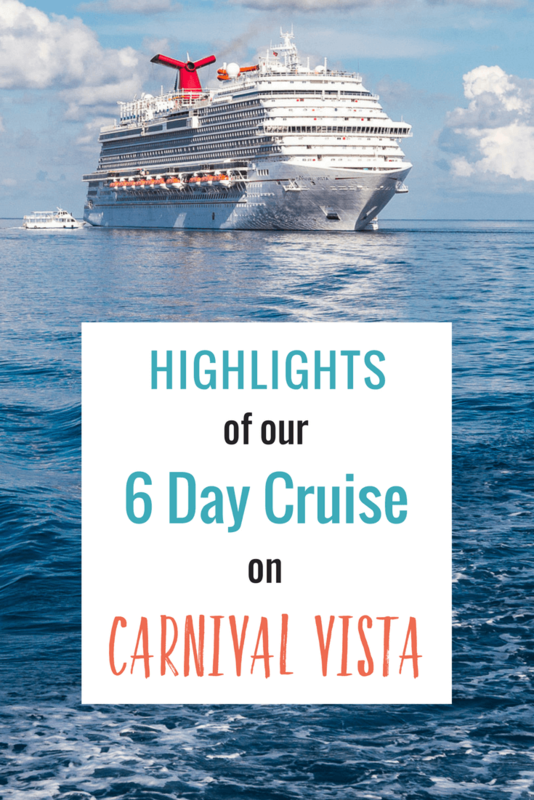 Actually, we’ve been impressed by the entertainment on all the Carnival Cruises we’ve been on and the shows on Vista kept us and our kids entertained and engaged. There’s singing and talented dancers and extravagant costumes and the beauty of it is it’s included in the cost of your cruise. That’s what we love about cruises, when you consider most of the entertainment is included, and your meals, they’re great value for money! 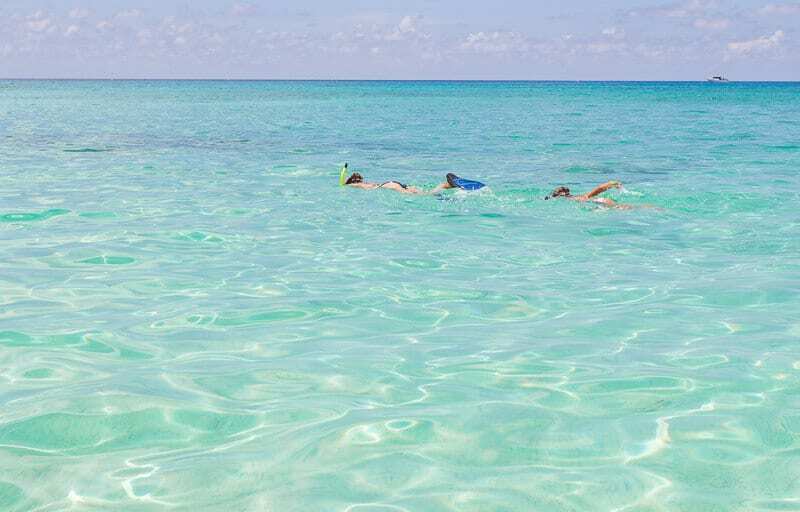 Let me say that after our short time ashore, the Grand Caymans is one place I can see us coming back to time and again – this Western Caribbean Islands is just beautiful. For this port of call we chose to go it alone and not do any organized tours. Having done several cruises previously and traveled to and lived in many countries around the world, we are comfortable with traveling independently. 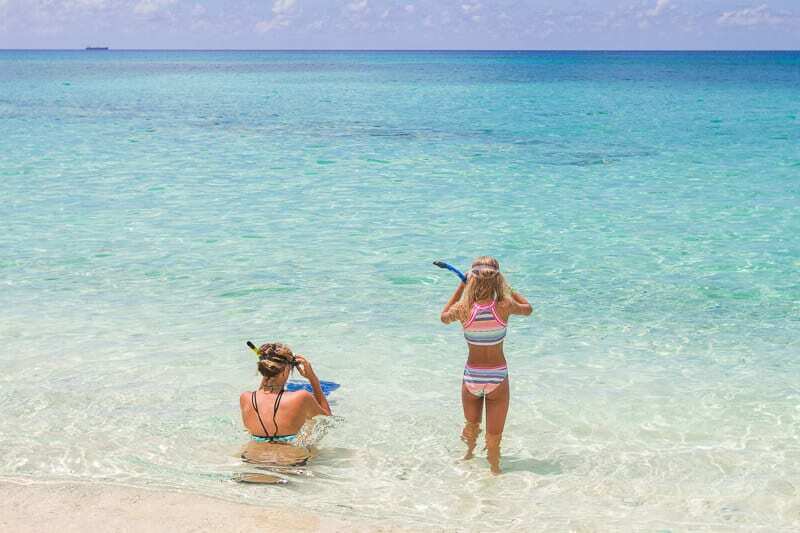 Plus, the most popular activity on Grand Cayman is Stingray City (swimming with wild stingrays) and we have been fortunate enough to have done this in Australia so decided to do our own thing. But, if you’re a first-time cruiser you might be better off one of the shore excursions and doing a tour. So we decided to hire a car. Initially we looked online but all the car rentals in George Town were booked (plan ahead), but after arriving in port we discovered Cayman Auto Rentals who were about a 5-minute walk along the main street. 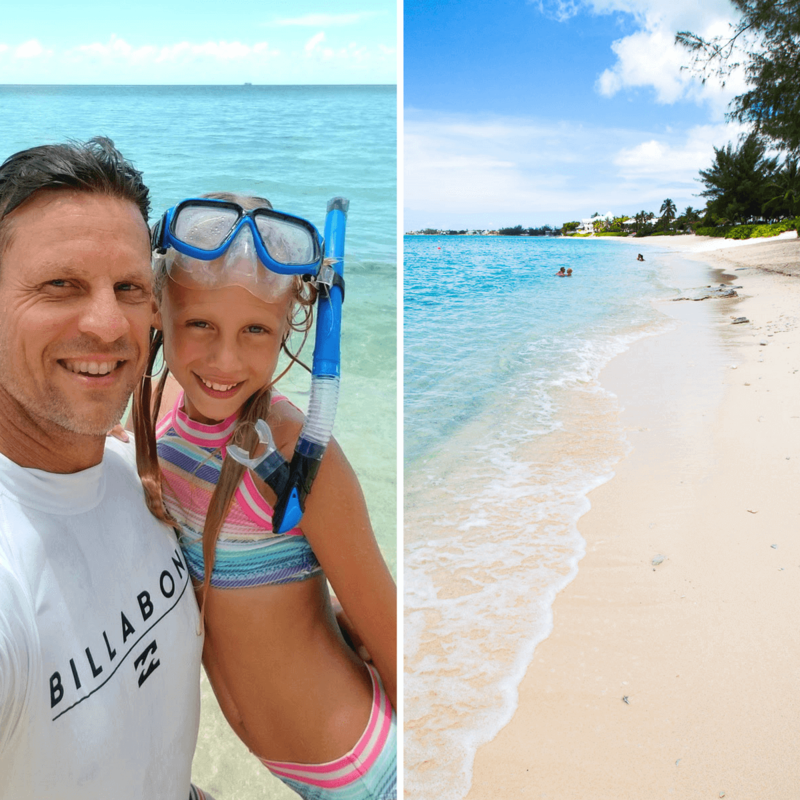 We love getting travel tips from the locals, and the lady working there was super helpful with insider tips on where to go snorkeling, where to swim with turtles, where to get the best coffee, and suggested a nice spot for lunch. Unfortunately, even if we wanted to go to Stingray City we couldn’t as you cannot drive there, you can only get there by boat! We hired a Kia Rio 4 door which cost USD$105 for the day and included a driving permit and insurance. For our snorkeling gear, we drove another 2-minutes down the road to Divers World and for $10 got a set of fins and a mask. They were also super helpful with local snorkeling tips! First snorkeling stop was Spots Beach, and it’s here that we saw a turtle whilst snorkeling and we basically had it all to ourselves. But the locals told us the best time for swimming with turtles here is early in the morning, around 7am, impossible when you are coming in off a cruise – but the water was amazing and the beach beautiful. The hot tip for a great snorkeling spot from the guy at Divers World was Marine Park, right in George Town out the front of the Paradise Seaside Grill. And what a great spot! 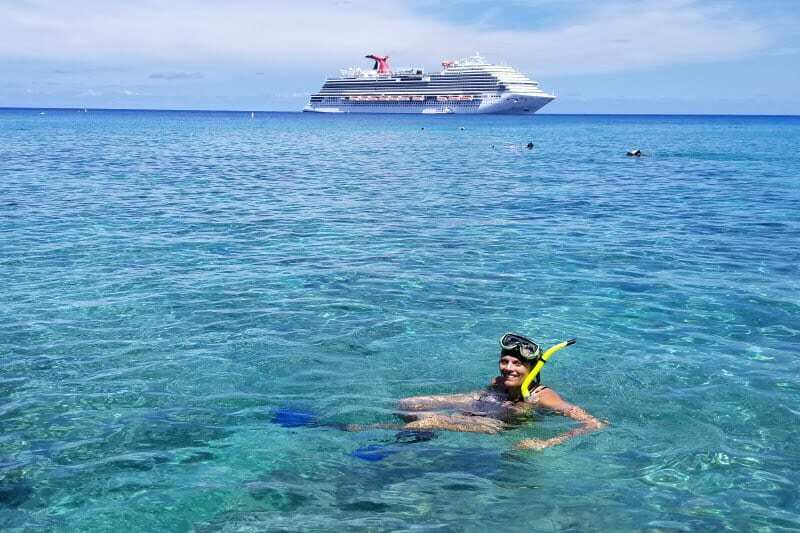 We snorkeled with large fish, saw some pretty coral, the water was perfect and you could see our Carnival ship right off shore. A part of famous 7 Mile Beach, Cemetery Beach is a short drive out of town and again picture perfect. We snorkeled and swum here and relaxed for an hour or so with dew other people in sight, then headed for lunch at the Da Fish Shack which offers stunning ocean views and serves up fresh local seafood! If you are going to rent a vehicle, it’s a good idea to not drive off too far away to the other side of the island and risk having an issue in getting back in time and missing the ships departure time. Stay within eyesight of your ship, or within an easy distance that if you have to hire a taxi or call an Uber you can. And plan to be back 30-minutes earlier than necessary as you need time to refill your car and drop your rental car and snorkeling equipment back! 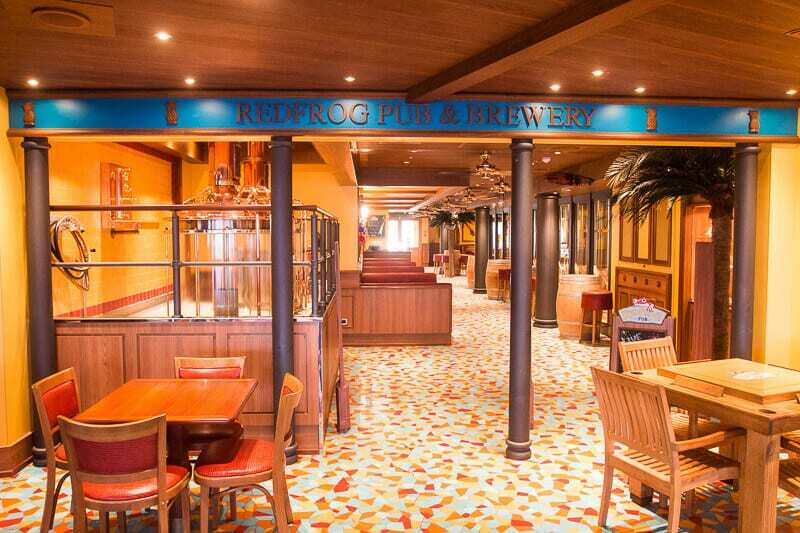 The Atrium Bar was our first introduction to our Carnival Vista cruise as we walked through the bar area during boarding, and whilst we didn’t immediately sit down others surely did for a welcome aboard drink! 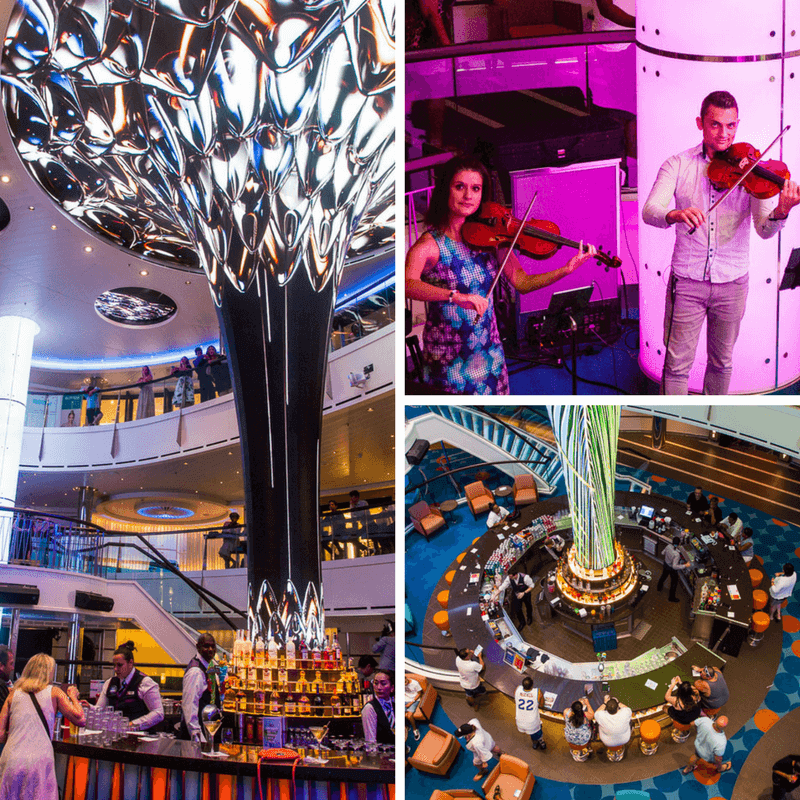 During the cruise, the Atrium was a nice place to sit for a quiet drink and listen to some chilled music – it features a funky LED column. We particularly loved the violin triplet who played some great cover songs – so talented! Another spot to sit and enjoy a quiet drink and some music is the piano bar. Family friendly too, it’s open from early evening and we took the kids in here one evening before dinner and had a fun family singalong. For a small tip, you can request your favorite song to be sung! I love my sports and had my eye on the Skybox Sports bar on day one of our cruise for what would be playing. And it just happened that our cruise coincided with opening night of the NFL, so I joined a packed bar of enthusiastic sports fans and took in the New England Patriots vs Kansas City Chiefs game. Another example of the Carnival Vista cruise being a family-friendly cruise is that they have comedy shows rated for families. We all laughed hysterically at the Punch liner comedy show we went to in the Limelight Lounge before dinner one evening, and if you’re into your comedy of course there’s the “adults” only comedy show later in the evenings. We enjoyed sitting in the outdoor beer garden area of the Red Frog Pub, which serves up it’s own craft beers, we stuck to the cider. Inside you can listen to live music, maybe participate in a little bit of karaoke, and if you want to turn back the clock to your college years, they even had a beer pong tournament!! Ok, before the cruise we chatted a lot about Camp Ocean (kids club) as it’s something our kids have enjoyed on previous Carnival Cruises. 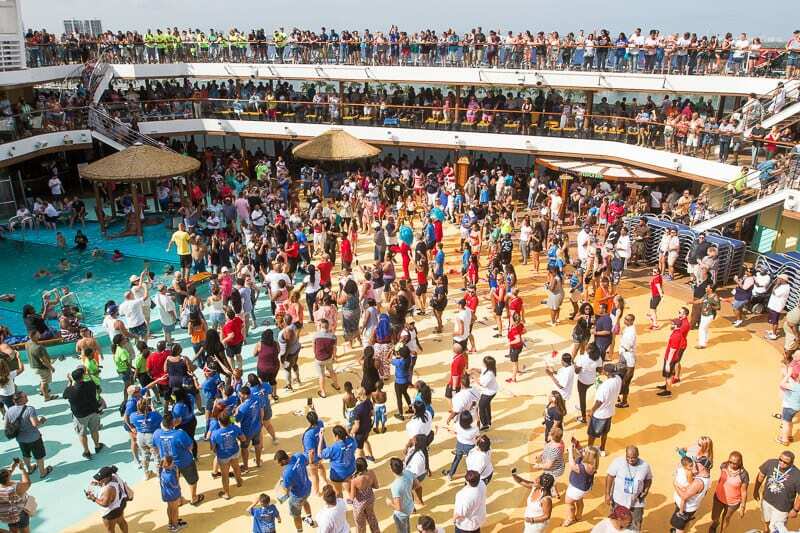 If you don’t know what Camp Ocean is, it’s basically a supervised play area on the ship where the kids are broken up into groups of similar age and play games and do cool activities in themed rooms. 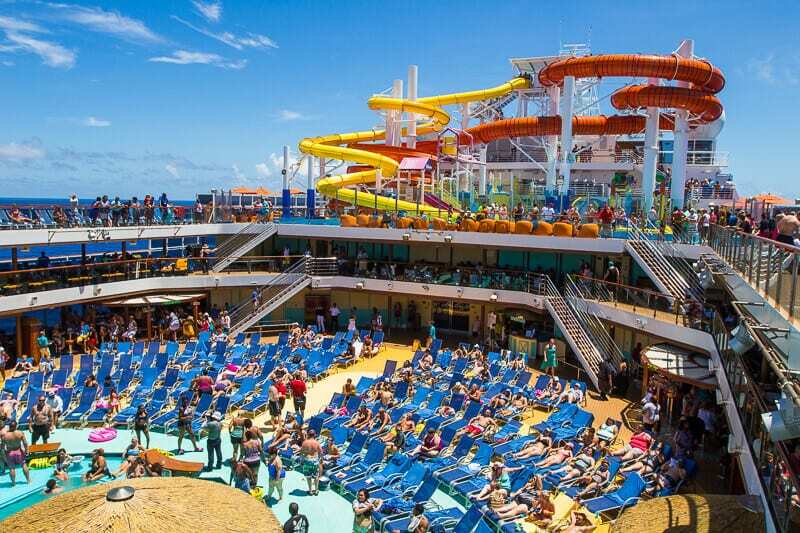 On Carnival Vista the age groups are; 2 to 5, 6 to 8, and 9 to 11. For the teens aged 12 to 14 there’s Circle “C” where they can hang out, meet new friends, and do activities like dance parties or watch outdoor movies. And for the high schoolers aged 15 to 17 there’s Club O2 where they can be similarly entertained with age related activities. So, can you believe that our kids never attended Camp Ocean once during the entire cruise?!!! It’s not that we didn’t offer it to them SEVERAL times, and maybe even tried to push them in there wink wink, but they were having so much fun with all the other activities on the ship they were content. But just know parents, that it’s on offer and from past experience our kids we well taken care of and have loved this part of cruise life. In Cozumel we chose to go it alone again and opted for a quiet day at the beach. We took a 20-minute taxi ride to a Beach Club near Paradise Beach, not the actual Paradise Beach Club but one just just before it, the name escapes my mind. Which is evidence that it wasn’t that memorable. For $60 for our family of four we had use of sun lounges and umbrellas, could play on the inflatable slides and climbing equipment in the water, and use their kayaks and snorkeling equipment. For $180 we could have purchased an all-you-can-eat-and-drink package, but glad we chose not to as the food was just ok, and we ended up leaving early as it wasn’t that great to be honest. The blow up equipment was dated and we ended up bored and wished we’d done something more adventurous. Keep in mind that we are Australians, we grew up on a beautiful beach, we traveled around Australia for 18-months seeing the most amazing beaches, we’ve lived in Thailand and traveled all over Asia, and have been to Hawaii a couple of times etc. My point is, if you’re from mid-west America, this beach might be absolute paradise to you. Don’t get me wrong, we still love beach life, but we’ve done it for so long and wished we’d used our time better. 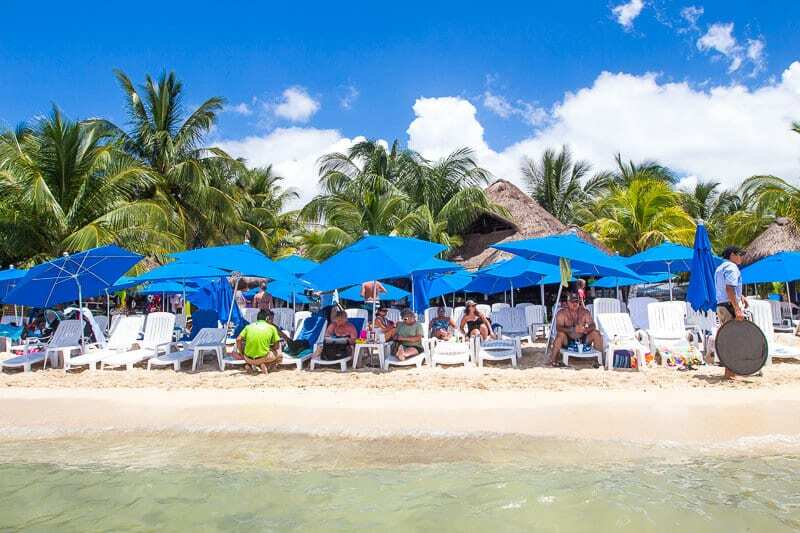 We were interested in doing the “Ancient City of Tulum” day tour, and after speaking with other cruises who did it they said it was amazing, but it was a very long day and it was HOT – keep that in mind if you have young kiddies like us! Ok, the not so fun part. Our 6 day western Caribbean Cruise on Carnival Vista just happened to be during Hurricane Irma. Now, if you CHOOSE to take a cruise in hurricane season, bare in mind that there is the odd chance that a hurricane could form and interrupt your cruise. Whilst we were never in danger and were fortunate to be cruising in the western Caribbean well away from Irma on the other side of Cuba, and the Captain assured us he’d keep us well clear (and a cruise ship can actually out run a hurricane), it still affected our travel plans and many passengers on the ship. Because of Irma, we couldn’t return to Miami on the Saturday (our due return day) and he didn’t know when the port of Miami would be open until damage had been inspected, so the captain gave passengers the choice of flying home early from Cozumel. Because our booked flights from Miami back to our home in Raleigh North Carolina had been cancelled, because we had a business conference to attend in Santa Barbara on the Monday, and because we had travel insurance to reimburse us for changing flights, we took the captain up on that offer. Turns out, the ship didn’t return to Miami until the Wednesday (4 days later) so we made the right choice. 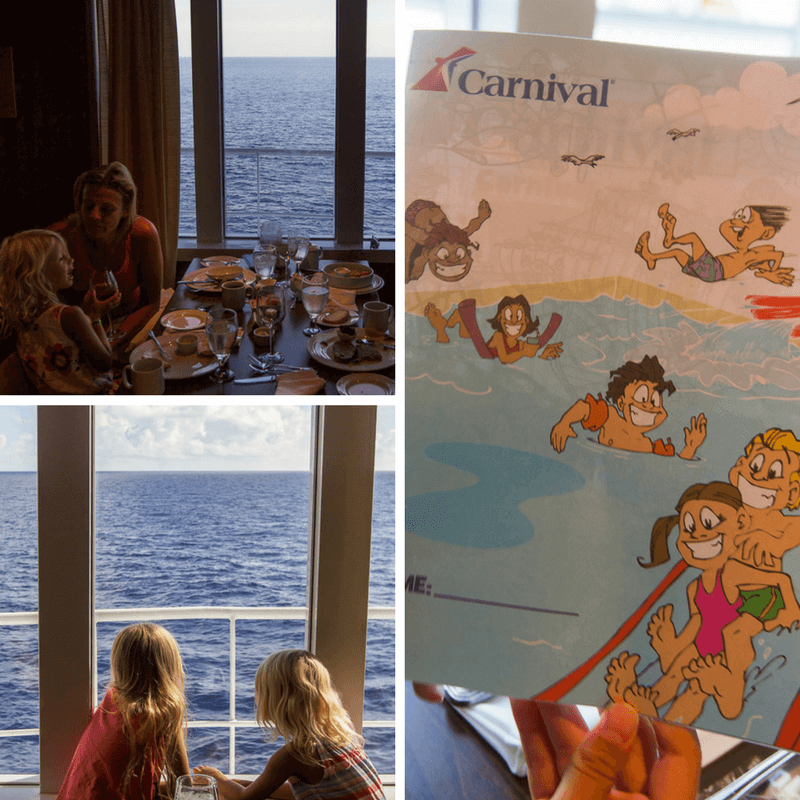 Our kids would have LOVED to have stayed on board for longer, and even though there was all this hurricane drama going on, it was the smoothest cruise I have ever been on. And our little inconvenience was nothing compared to what the people who were directly in Irma’s path were going through, and it was great to see Carnival’s response post Irma in delivering vital supplies to affected areas! Take your passports with you in hurricane season!!! Being Aussies, we naturally took our passports on the cruise. Whilst you can typically cruise with only your drivers license for ID, if you own a passport, and you cruise during hurricane season, bring it. Many other passengers also desired to fly home from Cozumel as they had family members at home in harms way, or pets, or they had jobs to get back to, but they didn’t have passports. NO, you cannot fly from any foreign country with your birth certificate or social security card as I herd a lady inquire at the customer service desk – you need a passport! Read more about our hurricane Irma experience in this post! 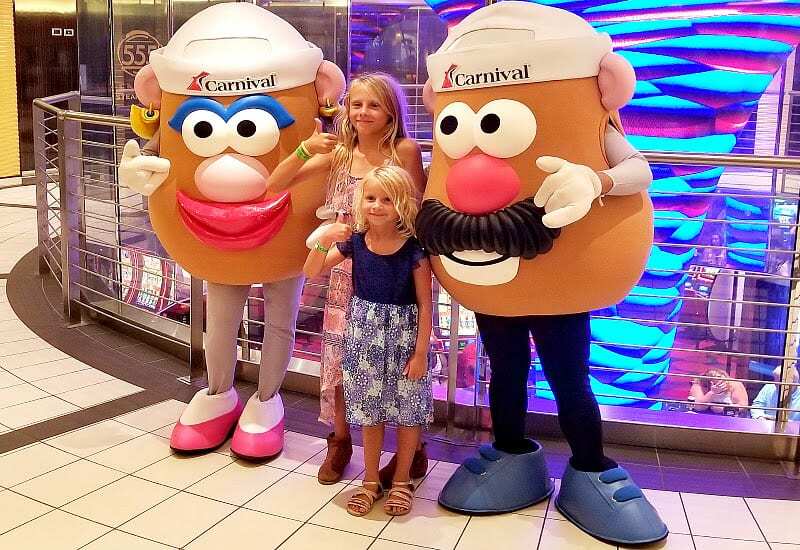 From this Carnival Vista cruise and our previous cruise experiences, below are our top tips for making it a memorable family vacation. If you are flying into your port of departure, arrive the day before and stay overnight to reduce the stress of potential flight delays and missing your cruise! 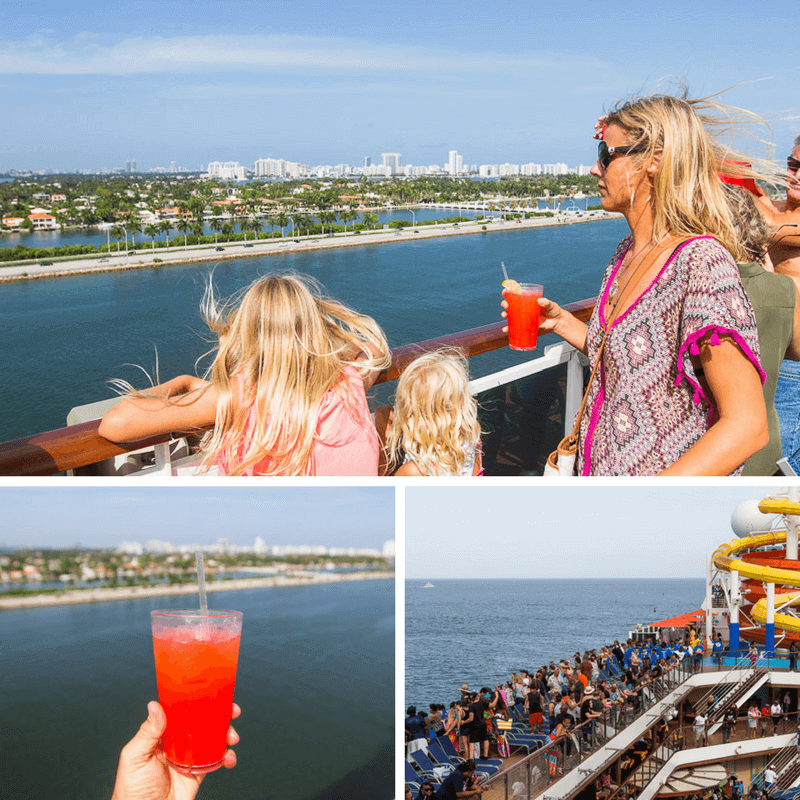 Our Carnival Vista cruise departed Miami at 4pm on a Sunday, so we flew in on the Saturday. You’ll be much more relaxed knowing you are in town and able to get to your ship with plenty of time to check in and go through port security (and park your car if you drive in). We stayed in the Coconut Grove area of Miami and loved our time their exploring Miami’s oldest neighborhood. When you first board your cruise ship, it can be a few hours before your luggage is delivered to your stateroom. So it’s a good idea to pack a few essentials like swimwear and a change of clothes in case the kids want to hit the pool or water slides immediately! 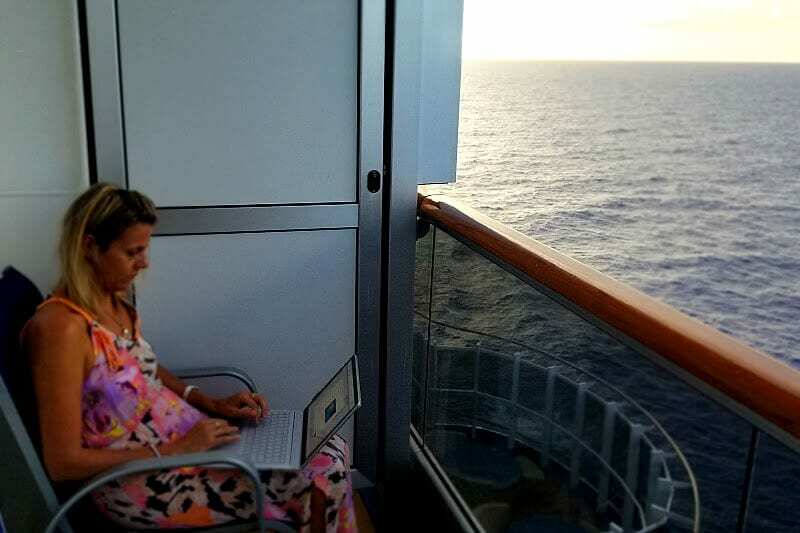 On a 6 day Caribbean Cruise, or probably any cruise, splurging on a balcony room is totally worth it. If your can stretch your budget, factor this into your expenses. Balcony staterooms come in particularly handy if you have young kids who still do daytime naps or go to bed early. Instead of being cooped up in an interior cabin you can sit outside on your balcony with fresh air and a book or maybe even a cheeky glass of wine. It can get a little cramped with family of four in an interior cabin, and a balcony gives you breathing room, fresh air, great views, lots of sunlight, a private outdoor space, and it’s nice to sit outside and see the sunrise or sunset, and see the place your visiting when you come into port. As mentioned our Carnival Vista rooms was 7264 and we loved the views! We always say that if you can’t afford travel insurance, then you can’t afford to travel”. Seriously, buying travel insurance from a trusted brand like our partner Allianz can be so cheap it’s a no-brainer, and peace of mind is priceless! A lady on our zip lining excursion in Jamaica injured her leg and had to be taken back to the ship – we don’t think it was that bad but what if she broke her leg and didn’t have travel insurance? Travel insurance is designed to cover unexpected medical emergencies and events such as trip cancellation, your personal effects, lost, stolen or damaged luggage by an airline or cruise line, and other related losses incurred while traveling. Saying goodbye to Ocho Rios in Jamaica – got lots of exercise here! Take the stairs instead of the elevator – by walking up and down to our cabin on deck seven, by staying at the front of the ship with the restaurant at the back, and by walking around all day to various activities, on one day we walked 10 miles…that’s 23,679 steps. You don’t have to walk 10 miles, but if you’re physically capable, ditch the elevator and take the stairs! Swap the buffet for the restaurant. Nuff said. Indulge the body. Head to the spa for a treatment. Get a massage or a facial. You deserve it. Your body will feel rested, restored and loved. Watch your alcohol and coffee intake. Cocktails on a cruise are enticing. It just suits the tropical vibe, right? It sure does not suit a tropical waistline though. Limit your syrupy cocktails. They wreak havoc on your skin, your liver, your digestion, and hydration. All of which amounts to a wicked hangover and lazy sun lounge attitude. It’s truly a waste of your cruise day. Get to bed at a decent hour. Sure have fun and let your hair down, but 6 nights of 2am finishes can wreck your body! 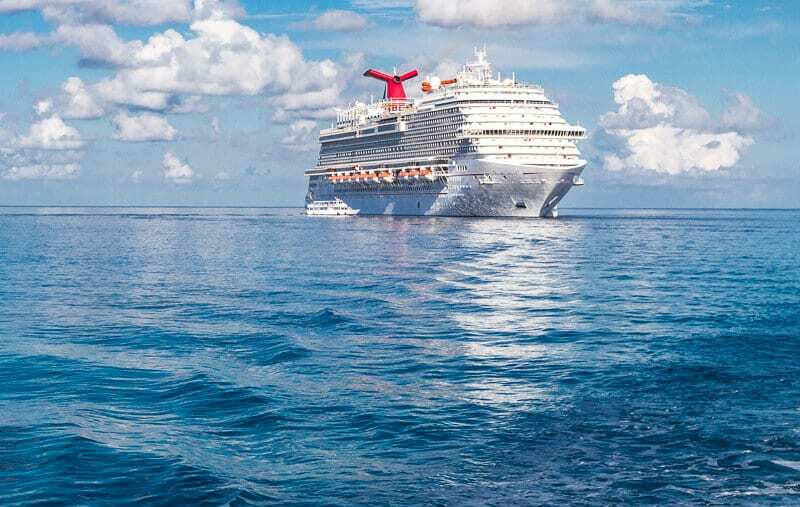 You can book your 6 day western Caribbean cruise on Carnival Vista via our affiliate link with Cruise Direct and you’ll never have to pay a booking fee. 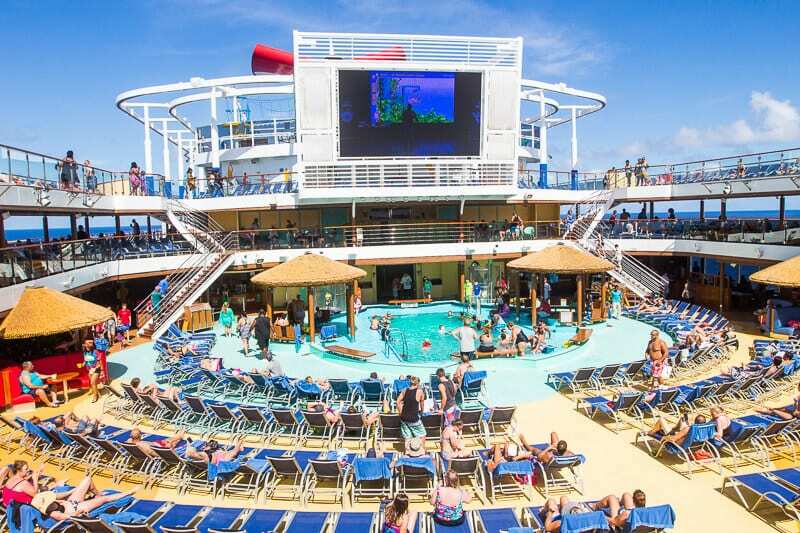 They also have a best price guarantee to get your best Carnival Cruise deals, offer flexible payment plans, and have all the Carnival Cruises to the Caribbean. Download the Skyscanner App. It’s an all in one flights, hotel and car hire search engine app and makes it easier for you to find the best travel deals! From Miami International Airport, it is 8 miles to the port of Miami and travel time is approximately 25 minutes. From Fort Lauderdale International Airport, it is 26 miles and travel time is approximately 45 minutes. We stayed at the Mayfield Hotel & Spa in Coconut Grove. From the hotel we jumped in an Uber which took about 20 minutes. You can read more about our stay in Coconut Grove and the hotel here. Thanks to Carnival Cruise Lines for hosting our cruise. All opinions and photos are our own! 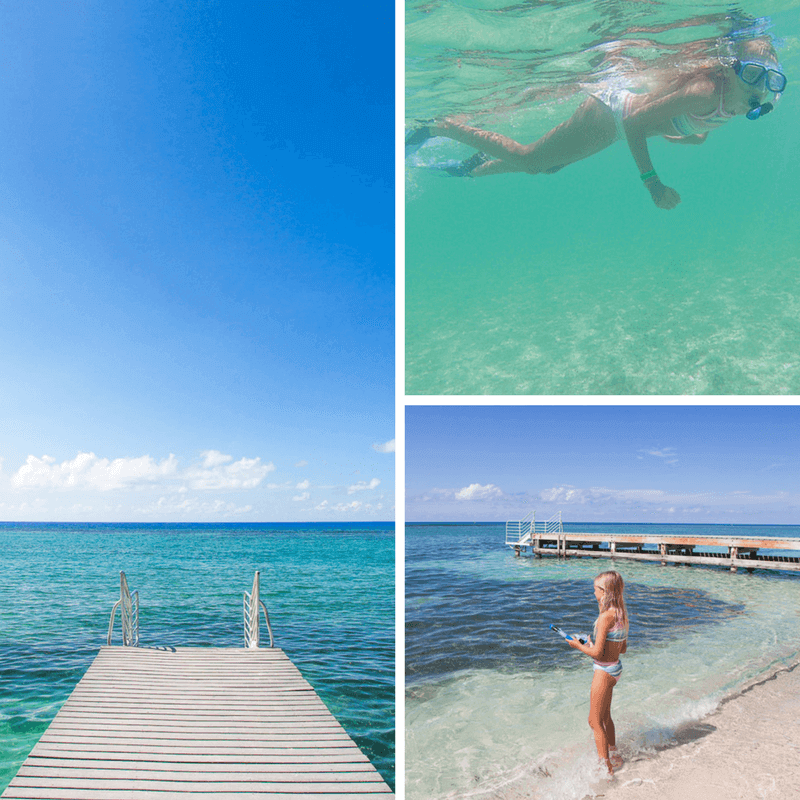 Would you like to take a 6 day Western Caribbean Cruise? Or any another Carnival Caribbean cruise? What would you love most about it? Tell us in the comments. Gorgeous photos as usual, Lucy. Sicily is already on my list and your pics of Catania make me want to go even more.